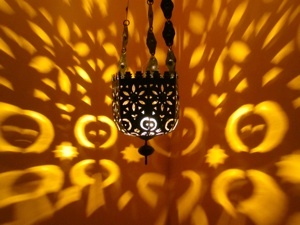 MOROCCAN IRON CHANDELIERS - what a magical light show! 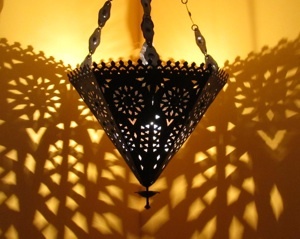 Eight triangles of carved iron panel meet at the point of the parasol and end at a rowel shaped finial.The upper border of the chandelier has been carved into an elegant lacework trim. Four chains of flat links suspend the chandelier and can easily be shortened if necessary. Click on the photo for a wider view. All chandeliers are measured from the top rim to tip of the finial. 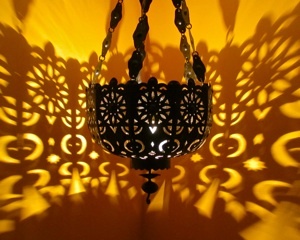 Ten curved panels of cleverly carved iron with a scalloped upper border form a large bowl shaped chandelier. And a fancy collar of the same metal with a sphere and hook finial completes the look. Similar but on a smaller scale, this little iron chandelier is composed of seven smaller carved panels finished off with a scaled down sphere and hook finial.